Last week, an old friend of mine emailed me asking me what my recipe for adobo was. I was like, “I don’t know, the usual I guess, you know, vinegar, garlic, etc.” I guess he was crowd-sourcing this question, so he ended up coming back to me with more questions: “Do you use lemon instead of vinegar?” “Do you marinate?” The variety was starting to trouble me: a recipe without garlic. Wait. A recipe with liver pate. What?! When I got these messages, I was wondering if my lola (grandma) was spinning in her grave just because I knew about all of this. I checked around to make sure the lights weren’t flickering on and off in the house like she was trying to communicate with me, then I decided to write this post to help a brother out. I’ll start with a bit of history. According to Amy Besa and Romy Dorotan’s excellent book, Memories of Philippine Kitchens, the vinegar braise that is the basis for adobo is indigenous. They point out that Ray Sokolov, in Why We Eat What We Eat, suggests that the Spanish gave the name adobo to this dish based on its loose resemblance to Spanish adobo (oil, garlic and marjoram). Me: Does anyone ever use lemon? Me: To replace the vinegar? Mom: I thought you were asking me about adobo?? Notice that this question is so baffling that she answers everything with a question. inuyaki: @crispywaffle I’ve never done that. If I ever did, then I wouldn’t call it adobo. What you add beyond vinegar and garlic is up to you. I have seen recipes with liver pate, ginger and green onion. I personally find this bizarre, but if it has vinegar and garlic, I’m not gonna say that it’s not adobo. 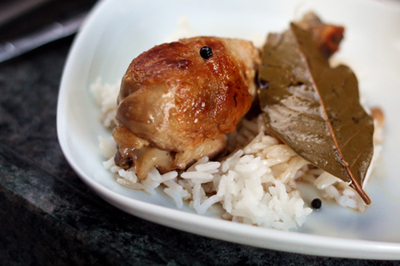 For pork or chicken adobo, there’s another thing that makes a ‘typical’ adobo: the process. Hell, there are only two necessary steps: braise and fry. “Reduce” is a new-fangled step that my grandma didn’t use, or that the Spaniards brought with them or something. (Okay, that speculation is not based on anything.) I like to reduce the sauce, but it’s not a necessity. But do you just braise the adobo without frying the meat? I’m sorry kids, but that is just nilaga. Fry the meat without simmering it? Isn’t that sisig? Now that I got that off my chest, I will provide the ratios for my adobo. I won’t claim it’s “D BEST!” or anything, it’s just what I like, and it’s a very good basic adobo because I learned it from my mom who is a Kapampangan cook, who learned it from her mom who was also a Kapampangan cook. And Kapampangans make some slammin Filipino food, seriously. Let’s not argue about that. DON’T STIR THE SAUCE BEFORE THE VINEGAR COMES TO A BOIL. I should have this tattooed up my arms and then wear a t-shirt with the words printed on it backwards for when I catch a glimpse of myself in the mirror in case I forget to look at the tattoo on my arms. Why? Because my mom can’t talk about adobo without saying these words. When you braise the adobo, you mix the sauce ingredients, but once you start heating it, Do Not Touch It. Mama’s not playing! Let the vinegar sauce come to a boil, then cover and allow to simmer until the meat is cooked through. This way, the acids in the vinegar mellow out and the ‘raw’ taste burns off. I have to admit, this has been so ingrained, I have never even tried to stir it. Why mess with what your mama says? The amount of soy sauce you put in is up to you. Some don’t even have soy sauce. My grandma made a version of adobo that had coconut milk in it. And hard-core purists say you shouldn’t even use soy sauce because this is a Chinese ingredient that was brought to the islands later on. True as that may be, a typical adobo these days often has soy in it. I tend to use very little and put in some salt as well. Balance it to your taste, or leave out the soy sauce entirely and just use salt. For a typical adobo, I go with vinegar and garlic, but also soy sauce, bay leaves and black peppercorns. This is not the law by any means, but many adobos I’ve had in Pinas, Europe, and the States, contain this quintet of ingredients. If you want to make a typical adobo, this is what you’d probably start with. So that said, here is my version. I will stick with chicken for this because Filipinos may argue until they lose their voices about what cut of pork to use. For chicken, I like dark meat for adobo, but a whole, cut up fryer chicken will work perfectly. Adjust the ratios depending on how much sauce you want. I like a lot of sauce because that is the magic elixir for turning plain white rice into God’s Food. If you make a lot of sauce, you will have to reduce it at the end so it thickens. If you want to skip the reducing step, don’t add water to the initial sauce. To this you will add about 1 kilo of chicken, cut up. Bring the whole thing to a simmer over medium heat in a large saucepan (if you are using a Dutch oven, make sure it is a Le Creuset or another kind of enamel-coated cast iron, otherwise it’ll react with the vinegar. Do not stir the mixture, cover and simmer over medium low until the meat is cooked through. For chicken, this won’t be more than 30 minutes. For pork, you can give it an hour or so, depending on the cut. When the meat is cooked through, remove it from the pot. Turn the pot with the sauce in it to medium high, and boil until the sauce reduces by about half. It should be much thicker. Remove from heat. Meanwhile, heat a few tablespoons of vegetable oil over medium high heat in a large saucepan. Add the chicken. If you have a splatter screen, use it. You’ll definitely see why. You can also cover it and just lift the lid when you need to turn the chicken pieces. Fry until they are crispy golden brown all over. Remove the chicken to a serving platter. You can either pour the sauce over directly, or use a strainer to strain out the bay leaves, garlic and peppercorns. My mom does that. I’m sure it’s because as kids we would scream whenever we’d bite into a peppercorn. But again, this is up to you. Maybe you like biting into peppercorns. Love this post. You gave me some tips I did not do or use. Thanks for posting this!! Second…thanks for the shout out. Third…last night when I threw together my adobo…I did the exact opposite and seared the chicken and then braised it. I don’t know what came over me. It wasn’t till I flipped over the chicken that I realized I was doing it backwards. Generally, I don’t pan fry the chicken after the braise. I like to take the chicken out and broil the skin to get it crispy. Here’s one version that contains soy and coconut milk. It’s the recipe from Cendrillon in NYC (RIP). The chef made this adobo on Martha Stewart’s show also. Beautiful. The auntie I learned from was definitely Chinese-Filipino so mine usually has soy sauce and, gasp, some brown sugar. Now when am I going to make adobo? Great post! That whole bit about peppercorns reminded me of when my mom taught me to make tomato sauce. I thought that everyone puréed theirs, but then I learned that she did that because her “children” (my father included :-P) couldn’t deal with chunks of onion. I think it’s cool that there are always so many versions of a dish like this (or tomato sauce, for that matter), but there are some things that cannot be changed. i’m still hearing about lemon in there.. the last correspondent even brought up coconut milk!.. PAC-MAN, please keep us together..
Gosh, why didn’t we see this post before we made ours???? So interesting to read. And the fact that you are funny tops it off! So looks like our version of adobo wasn’t tooooo far off. Good thing we didn’t add any lemon. Duo Dishes: Your adobo recipe was great! And honestly, I think coconut milk is acceptable. Am I starting to think the only big taboo is replacing the vinegar with lemon? ONE RULE! Your post not only made me hungry, but keeps me giggling about the lemon versus vinegar part. I had no idea I wasn’t supposed to stir it. I’ll keep that in mind. I’ll share with my mom. Wonderful recipe, it’s lunchtime in France, you make me hungry! I’m having filipino food and rice withdrawals!! I’ll definelty be trying this soon, although i’m positive it won’t be as good as your moms! This is one of the reasons why I can’t be a vegetarian. I adore chicken adobo. Several great tips, by the way. Thanks. I never knew about how you’re not supposed to stir until the vinegar has come to a boil. Love the post, you made me laugh. Going to try this recipe soon, my kids drown everything in vinegar anyway. Welcome to Foodbuzz, looking forward to more of your post! Now I am just intrigued about making it with coconut milk. sounds delicious. Thanks for sharing your recipe. I’ve been craving some of my mom’s adobo, and it seems your recipe is similar to hers (I think). I have to admit though, my memory recalls she used lemons. Maybe I should call her. A friend of mine at work who lived for years in southern Mexico states that their version of Adobo uses Lime juice as the acid ingredient. She brought some to work and was not bad. Plus you have to love a method of cooking that aftwards refrigeration is not required…. I am still in love with Adobong Manok which I remember from my days stationed there during the late ’70s. Thank you for bringing back memories and refining my technique for making Adobo. Sheryl – just going through your Filipino archives…I’m totally going to try my first foray into chicken adobo territory this weekend (which is bad to say for a filipina, even if I was born in Canada) Wish me luck! I just made this last night in the crock pot. Did it just the same, except at the end, I strained the sauce into a pot and reduced it for a few minutes on the stove. It tasted wonderful and since I work for the schools and the school year is about to start back up, it will be wonderful to have it simmering in the crock pot when I come home from work. Cook a little rice, and while it’s cooking, brown the chicken, reduce the sauce, make a salad and toast some bread, and presto, YUM! This is such a funny, informative and spot-on post about adobo! Someone once gave me a recipe for chicken adobo (clipped out of a magazine, I think) that called for … honey. By no means am I a purist, but my eyes nearly popped out of my head! Wha-?! Actually, adobo sa gata is considered a specialty of the province of Marinduque; turmeric is among the ingredients, giving the dish a slightly sunny hue. Have you seen today’s (1/6/11) NY Times recipe by Sam Sifton, adapted from a Besa/Dorotan recipe? Not only does it use coconut milk, but interestingly enough, it calls for marinating the chicken in the remaining ingredients overnight. What would your Lola say…? Lemon for vinegar? Isn’t that chicken ala pobre? Also, my conundrum about that blasted vinegar taste is now addressed! An aunt told me adding a tablespoon of sugar or honey would help the vinegar mellow out, but every time, it would just turn out to be a sweet adobo with the raw vinegar taste. My one uncle adds bagoong to his. Yum! My favorite is my dad’s though – he puts black beans in his. It is to die for!!! ThiS is very close to how my mom makes her adobo. She got her recipe from a lady at her work and the only thing that’s different is she doesn’t put water in her adobo! I think I am gonna try it your way and see if there is much difference!